We created a new sytle for police summer style that have padded rubber back in figer and kuckle areas. There padds protect the hand if they get any minor accident. The full leather palm and fingers and all in double. This glove has also the 1/2 lining in the cuff side. 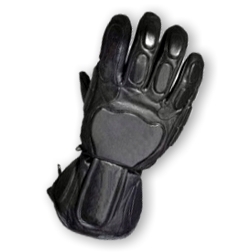 Very comfortable and delux glove that provide the dextarity during riding. o Cowhide Analine leathr outer shell. o Rubber padding in back hand. o Foam padded palm and thumb.